The Silkwood sugarcane water-quality monitoring site was established in 2014 as part of the Paddock to Reef Integrated Monitoring, Modelling and Reporting Program (reefplan.qld.gov.au). The Silkwood site was developed to monitor nutrient losses from sugarcane crop-soil systems, which contribute to the water quality of aquatic and marine ecosystems within the Great Barrier Reef catchment area. The site is located within the Wet Tropics region of north Queensland, and is monitored by the Department of Natural Resources and Mines. Farming practices are managed by MSF Sugar. The site has been fitted with four monitoring stations designed to measure runoff and deep drainage from four nitrogen application treatments. Each station is fitted with a 9-inch Parshall flume and rubber-wing walls. They are instrumented with a CR800 datalogger, automated refrigerated water sampler, pressure transducer, telemetry, and power equipment to measure and record flow and collect runoff water samples. The site was also fitted with two tipping bucket rain gages (pluviometer) to record rainfall volume and intensity, and a below-ground lysimeter system to measure and collect deep drainage of water and nutrients below the root zone of the crop. Data collected from the pressure transducers is used to calculate volumes of water lost from the system as surface runoff. These volumes are combined with nutrient concentrations collected by the automated samplers to produce total losses of nitrogen per unit area from each of the treatments throughout each crop cycle. 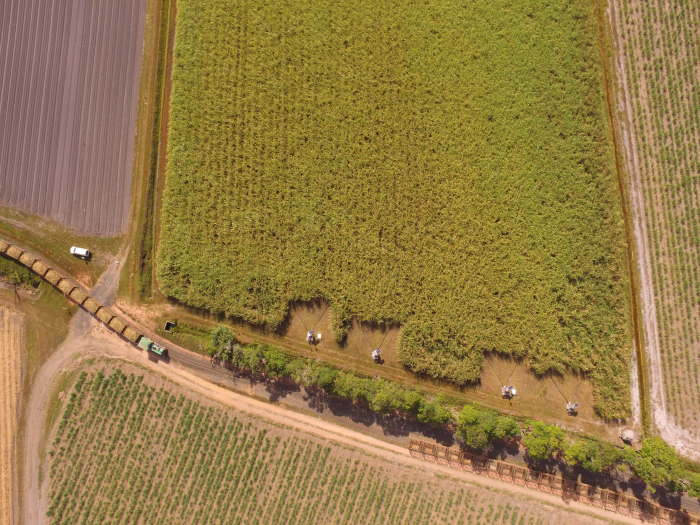 The measurements collected by the Campbell Scientific equipment are combined with several other factors to produce a comprehensive nutrient budget for the sugarcane crop-soil system at the Silkwood trial site. Since its establishment, accurate measurements of nutrient loss have been recorded over three complete crop cycles, and the information produced contributed to the greater Paddock to Reef Program (Technical Report 2014-16). The site is continuing to operate, increasing the data pool and enabling the modeling of nitrogen losses from the system into the future.